When I decide to cook with meat, I go all out. I’m talking monster carnivore. An aside: Reflecting on the past four days of dinner, I have had a different kind of protein every single night. I have eaten a small farm. Coming home and having your mom pay for groceries (AKA me not being cheap and making quinoa-based meals everyday) really does make a difference in terms of my diet. As soon as my parents told me they were going out for supper on Saturday night, I knew I wanted to treat the youngest Duff to a brother-sister dinner. Since I have a never ending need to impress him, I decided to unleash the power of pizza. But it couldn’t just be any pizza. Or any meal, for that matter. After googling several different combinations of “food to serve to your teenage brother,” I went to the land of all things wholesome and delicious: The Pioneer Woman Cooks. I finally decided her Steakhouse Pizza was a creation worthy of being inhaled by a semi-appreciative, grunt-if-he-approves brother. After a trip to the grocery store with my mom where I insisted that yes, a ball of good mozzarella was extremely necessary, and that a $12 flank steak was what needed to top this pizza, I got home and got cookin’. The smells that came from the kitchen when this was being prepared were gasp-inducing. Within minutes of sautéing, the red onions became translucent strands, their shiny purple backs absorbing the the balsamic that was slowly reducing in the pan. Then there was the marinara sauce combined with even more balsamic and a hint of Worcestershire Sauce. When baking, the smell of it bubbling on the crust made me stick my head in the oven even more than usual to absorb the aroma. Since no picture of the finished product can even begin to do the intricacy of this pizza justice, I thought I would stand on a kitchen chair and give you a bird’s eye view of the different layers. And because photos like this always lend themselves well to gif animations, here you go! Knock yourself out with excitement. I know it’s not as good as the one of Oprah and bees, but it will have to do. Garrett and I ate this in the family room while watching the Big Bang Theory. He said it was “actually good,” which in 18-year-old boy language means that he approves. I’m thrilled. We all enjoyed the leftover 1.5 pizzas as a family the next day and I wish there had been more. I swear he's happier than he looks! Saute red onions in butter and 1 1/2 tablespoons of balsamic vinegar over medium-low heat until dark and caramelized, about 10-12 minutes. Remove from heat and set aside. Combine marinara sauce with 1 tablespoon balsamic and Worcestershire sauce. Set aside. Grill steak over high heat until medium rare. Make sure you don’t overcook it. It takes about 15 minutes. Remove from grill and set aside. Also: I used a George Foreman-esque grill, but you can also use a BBQ or can pan fry it. 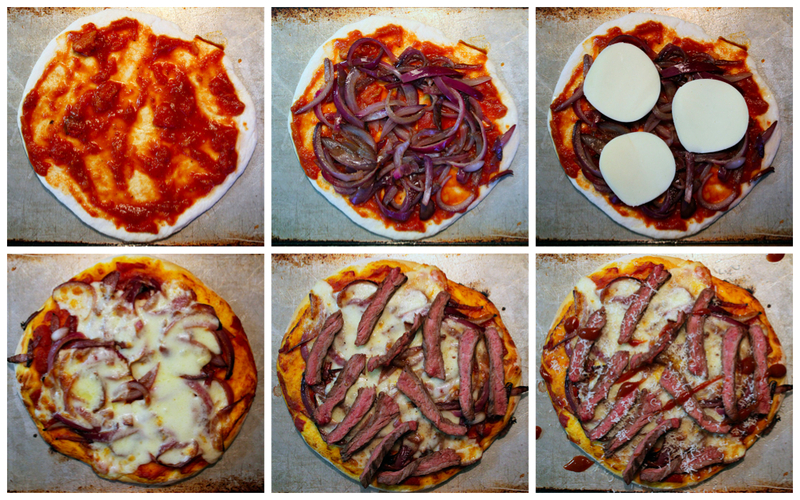 While pizza is baking, slice steak into very thin slices. Remove pizza from the oven, then drape slices of steak all over the surface. Drizzle the top of the pizza with steak sauce (use squirt bottle if you have one) and top the whole thing with Parmesan shavings. Stick it back in the oven for 3-5 minutes. Let sit on the counter for a few minutes and then slice and serve. Eat while watching the Big Bang Theory and almost choke on a piece of steak when Sheldon says something funny. Makes 3 medium-sized pizzas. About 4 servings. :) who needs Oprah’s favourite things when you have bees? No problem, Shelly, but most of the inspiration comes from the lovely Pioneer Woman, so full credit to her! I hope your husband loves the pizza – if he likes it even half as much as my teenage brother did, then you’re set! Happy cooking. Thanks mom. I’m glad there were leftovers, too, but I kind of wish I had hidden them away in my bedroom now… Omnomnom sneaky breakfast snack.